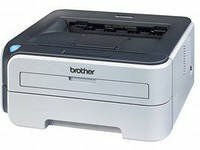 Brother HL-2170WR is a model of the black-and-white printer middle class, with excellent technical characteristics. It uses a laser beam printing with speeds of up to 22 pages per minute, with a maximum print format A4. The time when the first fingerprint is just 10 seconds. Has a wireless connection to the network through Wi-Fi and Ethernet. Print resolution printer average 2400 x 600 dpi. Dimensions printer has a standard 368 x 170 x 361 mm, weight 6.8 kg. It is perfect for both home and small office.